In the UK, films screening in cinemas need to be certified for an age rating by the British Board of Film Classification, who can make decisions for the country as a whole, or by a local council who can make a decision for the geographical area that they represent. 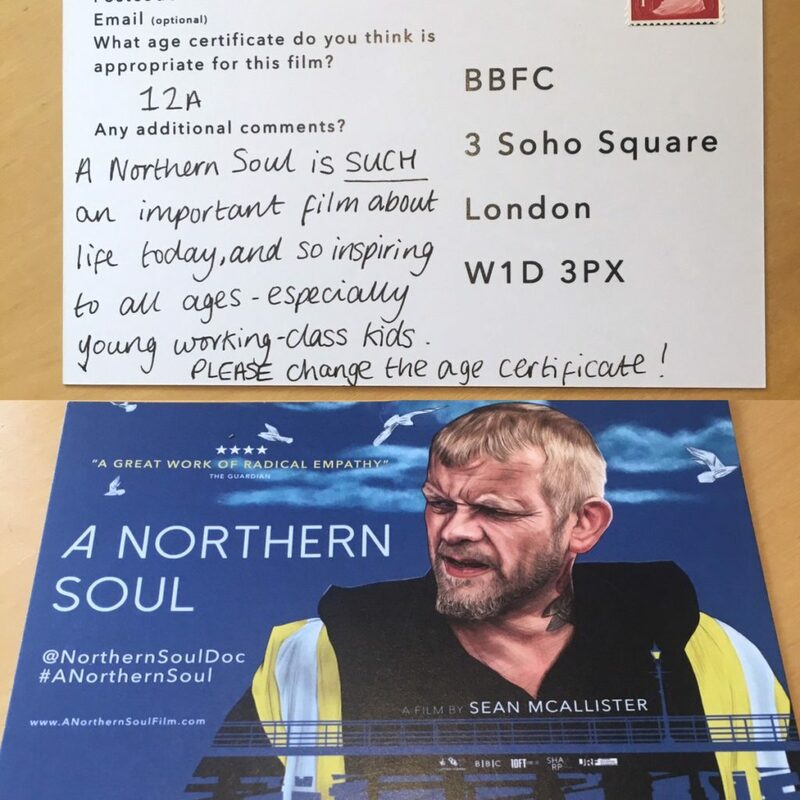 After being classified a 12A by Sheffield and Hull local councils, A Northern Soul was classified as a 15 by the BBFC, due to the perceived strong language in the film, namely, the total number of uses of the ‘F word’ that is above the recommended 4 uses of the term in any film. Exceptions to this rule can be granted, and the context is taken in to account – how the words are spoken, who they are spoken to and whether the language is deemed aggressive. A Northern Soul counts 19 uses of the F word, 14 in conversational contexts – never directed at anyone, never in front of children, never aggressive or hateful – and 5 in a song performed by Akala in the film. We believe that the rating makes the film seem to have a significant amount of strong language – because ‘strong language’ is often heard in every day speech, many people have not even noticed it. We are curious to question working class representation as a result of this. Because of the disparity between northern councils assessments and the London-based BBFC’s understanding – is there a class bias in the decision to award the film a nationwide 15 certificate? To say that this film, about an inspiring man is not appropriate for children under the age of 15 is also a double standards when we look at other films who are rated a 12A despite significant violence. Director Sean McAllister, Producer Elhum Shakerifar, MPs including Emma Hardy MP, Diane Johnson MP and Karl Turner MP, a number of local authorities, as well as members of the public we have consulted with at screenings, feel that the film should be granted a 12A certificate, therefore enabling young people to engage with the issues that appear on the screen. We keen to gather the thoughts from members of the public who have seen the film; specifically, whether you feel that the film should remain a 15 as classified, or whether you think that the film should be classified as a 12A. We need to gather your thoughts as grounds for a re-assessment. WHAT ARE PEOPLE SAYING ABOUT THE SITUATION? The BBFC makes assessments based on ongoing public consultation. We are therefore keen to enable and encourage members of the public to share their thoughts about this issue. -Bradford local Connor Drake recently started a petition to get Bradford Council to reclassify the film a 12A, and it worked! Bradford had initially refused to view the film but thanks to Connor adding his voice, teenagers in Bradford were able to watch the film. Please note that the BBFC certification is only applicable to cinema screenings – as such, screenings in community spaces, schools and cinema clubs wouldn’t fall under this certificate. Please contact us for more information, or if you would like to book a screening.